In January, 2006, it was revealed that Halliburton subsidiary KBR had received a $385 million contract to build detention facilities "for an emergency influx of immigrants." KBR stated at the time that it was a "contingency contract" and that it "was conceivable" that no such facilities would actually be built. Since that time there has been a lot of conjecture but little in the way of proof that construction of "FEMA camps" had begun. 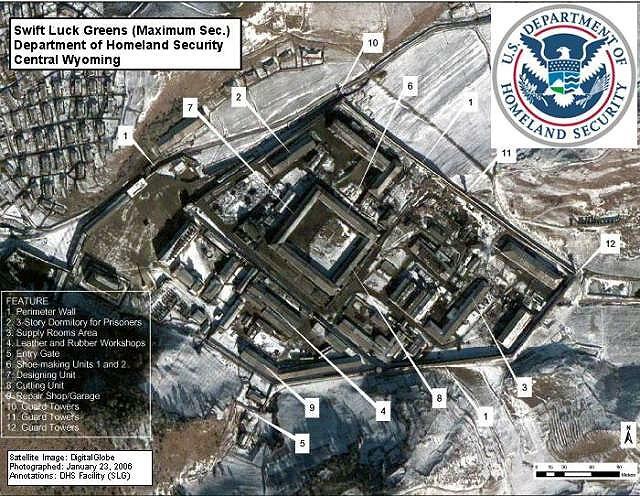 But, on March 28, 2009, the satellite image at right of the "Swift Luck Greens" facility in central Wyoming was "accidentally" made available by the Department of Homeland Security and pulled down within an hour. Several other images are also available and can be found with a simple Google search. There have been a lot of stories over the years and even photos of detention facilities and special train cars for transporting dissidents. We have generally avoided them because, even if true, they only revealed the government’s "endgame strategies" and we were not yet in the endgame. But things are different now. Things are moving quickly and the fact that this facility exists is an indication that others exist and Americans need to know that "they" are moving us into "check."